The twenty four week course is our minimum recommended training for entry-level farriers. It will introduce you to the study of anatomy, physiology, biomechanics, equine movement, and will provide you with an understanding of conformation and its effect on the developmental phases of young stock and the adult working athlete. Through this study, you will learn to trim and shoe horses to achieve and maintain limb and foot balance. 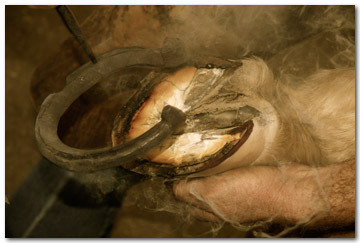 You will go beyond basic shoeing of sound horses with ready-made shoes to gain a working knowledge of shoe building, including remedial and therapeutic shoes. In addition to learning how to use your tools, you will learn to make a variety of farrier tools, particularly forging tools, coordinating the skills gained both in forging and welding. Students will learn how to recognize and evaluate equine lameness and acquire a strong foundation to help you sort fact from fiction in the field of farrier science. You will also learn aspects of the equine and farrier industries that will inform you of regional breed and sport populations that will help you to make decisions regarding the start of your business. Live Horse Trimming 232 hrs. Shoeing Feet & Horses 235 hrs.